After a busy day of city exploring or outdoor adventuring, what could be more relaxing than a good long soak in a soothing and relaxing Jacuzzi tub? If this sounds like your idea of heaven, you are about to be spoiled for choice as we present a list of America's favorite romantic couple's getaway hotels and inns which go the extra mile to pamper guests with either a personal in-room Jacuzzi or the option to use one in the spa. Located in some of the most sought-after destinations, these pampering cocoons will also treat you to many other luxury touches like fine linens, upscale toiletries, and beautiful décor to make your vacation or weekend getaway totally unforgettable. For the ultimate luxurious escape to a perfect tropical island, you would be hard-pressed to beat Little Palm Island Resort, located on a private islet off the picture-perfect Little Torch Key. The resort has long been a favorite with celebrities hoping to find a serene bolt hole surrounded by azure waters and luxury accommodation. For the ultimate Little Palm experience, you can book either the Island Escape or Island Romance suites, both of which have private decks featuring a Jacuzzi whirlpool or hot tub. You can spend your days snorkeling, scuba diving, sport fishing, or simply relaxing on a comfortable lounger at the edge of the ocean. Perfectly located in the heart of the Gaslamp Quarter, the 1890 Keating Hotel is an ideal choice for your next visit to San Diego. All the rooms and suites at the hotel feature many luxurious touches, such as B & O sound systems, Frette linen, and Lavazza coffee machines, but the Fresca Spa Suite takes luxury to another level by including a private atrium where you can relax and unwind in your personal Jacuzzi tub or enjoy a sensual alfresco rain shower. To make it easier for you to plan your escape, the Keating Hotel offers a selection of special packages that can be fully customized to suit your every desire. Spread out over an area of 113 forested acres in the heart of Litchfield Hills, Winvian Farm is home to 18 stunningly unique cottages that entice guests to relax and unwind far from the bustle of the city. All the individually themed cottages feature radiantly heated stone floors, huge open fire places, and an emphasis on wood and natural elements. 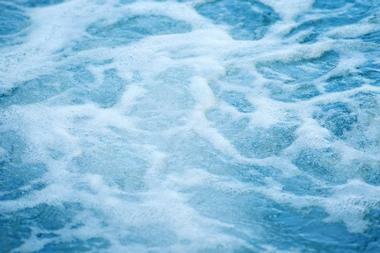 Several of the cottages have spacious Jacuzzi tubs as well as walk-in rainforest showers. If you can bear to leave your comfortable cocoon, you will find a wide variety of outdoor activities on your doorstep, including hiking, biking, canoeing, kayaking, and even hot air ballooning. Winvian Farm also has a well-stocked bar and wine cellar and serves fresh farm-to-fork cuisine. 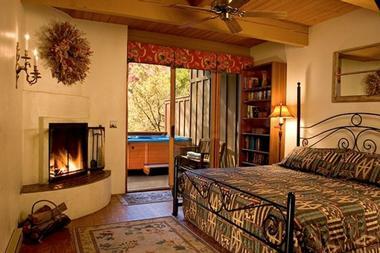 Spectacularly located in a pristine forest environment in Oak Creek Canyon, the Junipine Resort is a haven of peace and tranquility just 8 miles from Sedona. Each of the spacious wood and stone themed Creek Homes are fully equipped for four to six persons to relax and enjoy a serene country break. To add the ultimate touch of luxury, you can book one of the creek view or forest view hot tub homes, which each have a private outdoor hot tub on an outdoor redwood deck. All the homes feature full kitchens – you need never step outside your private haven. Activities in the area include hiking, fishing, and scenic drives. Visitors to the vibrant city of Chicago can exchange the ordinary for something decidedly extraordinary when they check into the Acme Hotel in downtown Chicago, close to some of the city's most hip and happening restaurants and clubs. 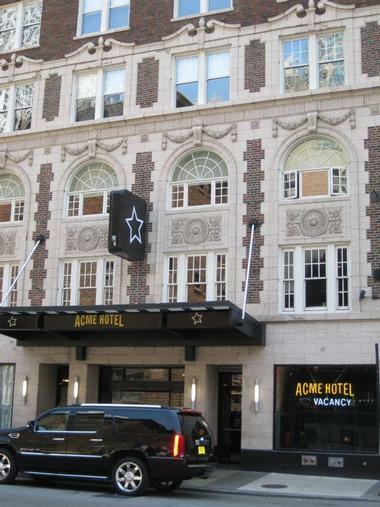 The rooms at the Acme Hotel are not your average hotel room and have been carefully designed to offer everything a trendy traveler could require, including great electronics, wireless audio systems, and ultra-fast Wi-Fi. The hotel boasts two cocktail bars, a restaurant and, the cherry on the top, the Bunny Slope, where you can relax and enjoy a drink in a spacious Jacuzzi tub. Perfectly located in downtown, the Alexis Hotel in Seattle offers discerning visitors the last word in luxury with a variety of suites offering a very high degree of pampering. If you yearn to soak away the city stress in your own personal Jacuzzi, you will need to book the Spa Suite or Honeymoon Suite, both of which include a sumptuous jetted tub large enough for two. The rooms and suites are all beautifully decorated using a relaxing neutral palette of creams, browns, and blues to ensure the most relaxing ambiance. When you are ready for a drink or meal, the Bookstore Bar and Cafe is waiting to satisfy your appetite. Next time you plan a visit to Reno you can treat yourself to the vacation of your dreams by booking the very special Jacuzzi Suite on the 25th floor of the Atlantis Casino Resort and Spa. These spacious suites offer sweeping views of the Sierra Nevada from their enormous floor-to- ceiling windows as well as your very own personal Jacuzzi in the beautiful marble bathroom. If you can drag yourself away from the soaking tub, you can visit the Concierge Lounge for complimentary breakfast and afternoon hors d'oeuvres. If the Jacuzzi Suite is beyond your budget, you can still enjoy the resort's outdoor whirlpool spa and both indoor and outdoor swimming pools. Look no further than the delightful Belamere Suites Hotel in Perrysburg, Ohio, for your next romantic getaway. The hotel has won multiply awards in the "romantic" category and was voted the overall best establishment in 2017. 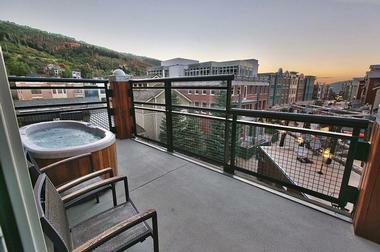 The hotel offers a variety of suites, all of which feature a private double Jacuzzi and double walk-in rain shower. If you book a Presidential, Royal, or Grand Royal Pool Suite, you will not only have a private Jacuzzi but also your own private heated pool. 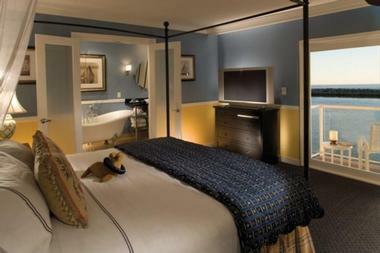 The suites are lavishly appointed, and a continental breakfast will be delivered to your room at your requested time. 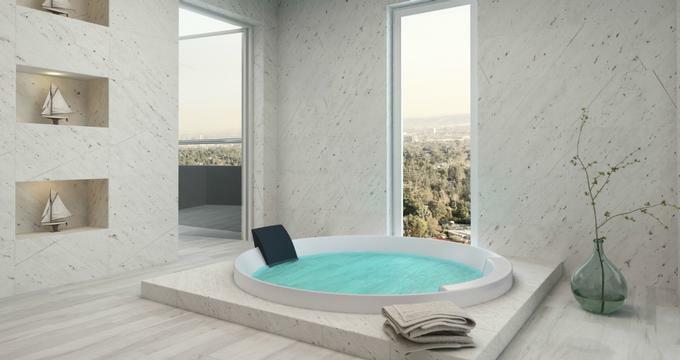 After spending hours on your feet in the city that never sleeps, you will be able to look forward to a relaxing soak in your very own hot tub when you book one of the fashionable suites at the Dream Hotel Downtown. The hotel is perfectly situated on 16th Street, close to Chelsea Market and The West Village, and is the last word in trendy New York living. In addition to offering visitors in the South Tower and Presidential Suites a private outdoor terrace with a hot tub for two, you can also enjoy the hotel's wonderful Beach Club, where you can soak up the sun alongside the 50-foot glass-bottomed heated pool. When it's time to swap the hustle and bustle of city life for a serene sojourn in the delightful Napa Valley, the Harvest Inn at St. Helena is an ideal choice for relaxation and pampering. The inn offers visitors a wide choice of rooms and suites, and although the rooms do not have private Jacuzzis, guests have access to two outdoor pools and Jacuzzis, one of which is reserved for adults only. Most of the rooms and suites have wonderfully relaxing vistas of gardens and vineyards, and the restaurant serves innovative Napa Valley meals by Chef Charlie Palmer, accompanied by your choice of wine from dozens of surrounding wineries. 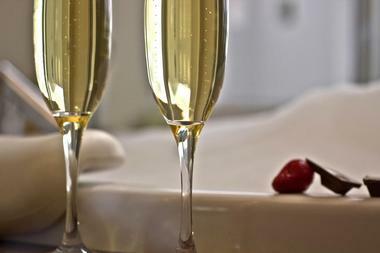 There is also an on-site spa, and winery tours can be arranged. 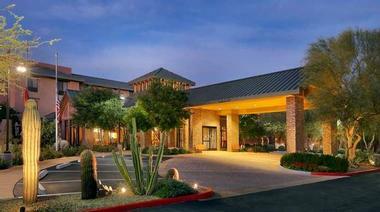 The Hilton Garden Inn in Scottsdale North offers visitors to the area a convenient and relaxing base from which to explore several Scottsdale attractions, including e World Equestrian Center and the Tournament Players Club. If you can stretch the budget to allow booking one of the light and spacious two-room suites, you will have the luxury of your own personal whirlpool tub, where you can relax after a busy day. If you cannot afford a suite, you can still look forward to relaxing around the outdoor pool and the gently heated Jacuzzi. The hotel also has a gym and spa and there are multiple outdoor activities available close by. The beautiful town of Aspen really has it all for visitors, regardless of the time of year you choose to visit. Make the most of your Aspen vacation by treating yourself to one of the delightful Jacuzzi Suites at Hotel Aspen and experience the pleasure of a long relaxing soak on your own private terrace surrounded by the outstanding natural beauty of the mountains. Whether you are visiting in summer to enjoy hiking or the cultural attractions of the city or are planning a winter wonderland skiing trip to one of the best winter-sport destinations in the US, a Jacuzzi Suite at Hotel Aspen will provide a welcome and pampering retreat at the end of each busy day. On your next visit to vibrant Chicago, you can live the high life for a day or two by checking into one of the sumptuous suites at Hotel Palomar. A member of the Kimpton group, Hotel Palomar offers the last word in luxury, pampering all guests who book a suite with relaxing double Fuji-jet soaking tubs, luxurious robes, and brilliant city views from the floor-to-ceiling windows. If you can drag yourself away from your beautiful suite, you can enjoy the on-site gym and spa or relax around the rooftop indoor pool and sundeck before enjoying your favorite cocktail and a delicious dinner at the on-trend Sable Kitchen and Bar. Having won several awards for being one of the most romantic bed and breakfast establishments in the US, the Inn at Bowman's Hill in Bucks County, Pennsylvania, is an ideal place to escape to for a few days of relaxation and pampering. The inn has four charming suites, all of which have been carefully equipped and decorated to provide a haven of peace and relaxation. All suites have private Jacuzzi tubs for two in addition to walk-in showers, and most offer direct access to the gardens and beautiful outdoor pool. 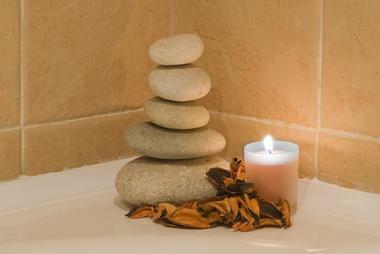 For the ultimate pampering session, you can arrange a couple's massage in your suite. The inn is close to several nature preserves and wineries, and there is a great local pub just around the corner. You will never want to leave your luxurious Spa Suite at the Rustic Inn Creekside Resort and Spa just outside Jackson Hole. 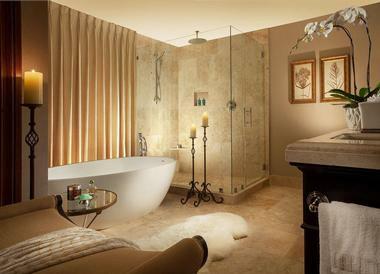 The classically decorated luxury suites feature amenities such as ultra-comfortable king-sized beds with luxury linens, spa-themed bathrooms with a large soaking tub and steam room, a walk-in rainforest shower, and the luxury of your own private terrace hot tub. The resort is a perfect base for a ski holiday, offering delightful outdoor firepits in winter and ski/snowboard rental on site. In the summer, you can enjoy nature and hiking before returning home each evening to soak your aching muscles in the hot tub. 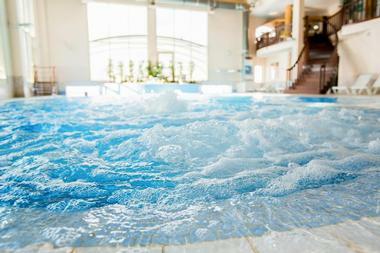 If you cannot afford a suite, you can still enjoy the outdoor heated pool, Jacuzzi, and 24-hour gym. Perfectly positioned for both business and pleasure-seekers, the Loews Hotel in downtown Minneapolis offers visitors both style and luxury in the heart of the city. Although all the rooms and suites at the hotel are luxuriously appointed, you can elevate your experience by requesting one of the hotel's exclusive Executive Whirlpool Rooms. 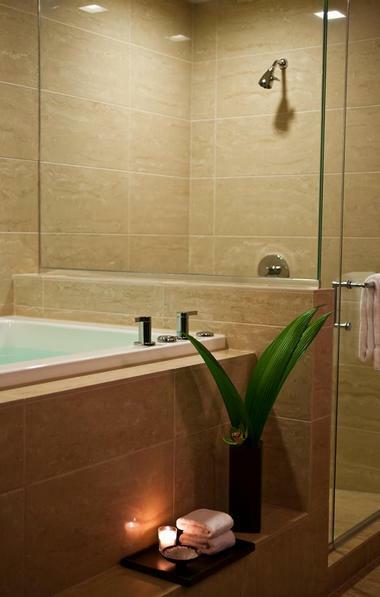 After a busy day of meetings or exploring all the cultural and historic attractions of the city, you can return to an oasis of calm and soak away the stresses of the day in your private Jacuzzi. If you visit on the weekend, you will get free breakfast, Wi-Fi, and parking to further sweeten the deal. You can take a vacation in the lap of luxury when you check into one of the sumptuous residences, suites, or penthouses at Main and Sky in Park City, Utah. Most of the suites and apartments feature private balconies with your own relaxing hot tub (check when booking), where you can enjoy a luxurious soak while looking out at the surrounding ski resorts. Not only can you soak in your own hot tub, but you can also enjoy a game of pool and your own wet bar without stepping out of your apartment. Main and Sky is perfectly positioned just steps from town life for skiing and several brilliant dining and shopping venues. Nestled in the heart of Amish Country in Ohio, the Murphin Ridge Inn offers a stylish and relaxing escape from the city, perfect for a romantic sojourn or a family vacation. To ensure a private Jacuzzi, you need to book one of the lovely cabins at the inn, all of which feature whirlpool tubs and double walk-in showers and private porches with traditional wooden rocking chairs – the perfect spot to relax with a good book. Area attractions include hiking trails, waterfalls and birdwatching as well as driving around the main small towns to search for antiques and homemade Amish crafts. To ensure your vacation at the Outrigger Waikiki Beach Resort is totally unforgettable, you can book one of the resort's Deluxe Oceanfront Rooms (there is just one of these rooms on each floor), which feature added luxury touches like a king-sized bed, in-room Jacuzzi tub, coffee-maker, black-out drapes, and more. If you don't manage to book one of the rooms in this popular category, you can still enjoy a relaxing soak in the resort's large outdoor Jacuzzi. The Outrigger Waikiki Beach Resort is perfectly positioned to enjoy all the wonderful sea and surf activities that Waikiki is famous for as well as lush tropical forests and excellent shopping and dining. Escape to the beach for a memorable vacation at the Portofino Hotel and Marina on Redondo Beach, close to bustling LA. The Portofino offers the ideal beachside location and the best room in the house is without doubt the luxurious Ocean Jet Tub Room, which has a romantic jetted bath tub for two as well as a delightful private patio with partial ocean views. You can spend your days walking on the beach, soaking up the sun, or enjoying other activities such as sailing, kayaking expeditions, game fishing, walking tours, or neighborhood farmers markets. The hotel offers free bicycle rental if you would like to explore other nearby beaches. Providing visitors with a serene garden setting just a few steps from the bustling main street of Provincetown, the Provincetown Hotel at Gabriel's is a long-standing favorite bolt hole on beautiful Cape Cod. 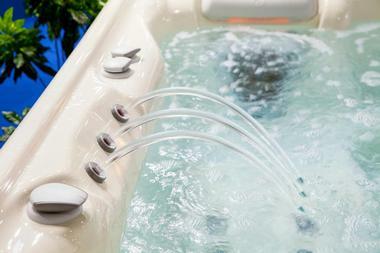 The hotel offers a variety of rooms and suites, and there are several that offer luxurious Jacuzzi tubs for two. In addition, most of the larger suites have kitchenettes and some have a private outdoor terrace – the perfect home-from-home after a busy day of exploring the beaches and art galleries of this quintessential Cape Cod town. The hotel is famous for serving delicious freshly prepared breakfasts and will even deliver yours to your room if you would like to eat in. If you are planning a romantic getaway to magical New Orleans, you should consider checking into one of the fabulous rooms at the Royal Sonesta, which is perfectly located right on famous Bourbon Street. The entire hotel was recently renovated, and you can request one of their special King Bedrooms, some of which have both a jetted tub in the bathroom as well as a spacious in-room Jacuzzi. You can also expect a host of luxury touches such as a wet bar, up-market toiletries, and fine linens. If you can bear to drag yourself away from your lovely room, you will find all the attractions of the city on your doorstep. You can add a touch of luxury to your next Niagara vacation by booking the spacious and luxurious Penthouse Apartment or one of the Center or Corner Suites, all of which come with an in-suite Jacuzzi tub as well as a large walk-in rain shower. If these luxury options are beyond your budget, you can still enjoy relaxing in the large whirlpool tub at the spa, where you can also arrange a relaxing massage or other treatment. There is an endless list of things to do at the resort besides trying your luck at the tables – you can enjoy a show, have a great dinner, or step outside the resort to marvel at the beauty of famous Niagara Falls, go for a hike or boat tour, or shop at the famous Outlet Mall. 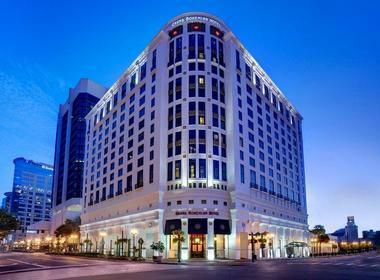 A popular choice for a honeymoon or romantic getaway in Florida, the Grand Bohemian Hotel in Orlando has all the necessary ingredients to set the scene for an unforgettable vacation. 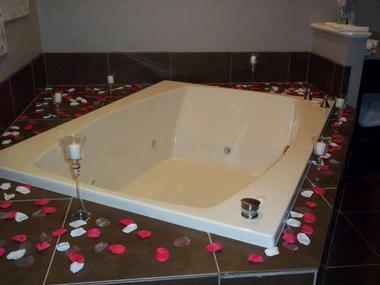 To truly indulge your partner, you can book one of the coveted Jacuzzi Suites, which feature additional space in which to spread out (a living and dining area with another TV) as well as the signature treat – a beautiful Jacuzzi for two that opens to the bedroom. 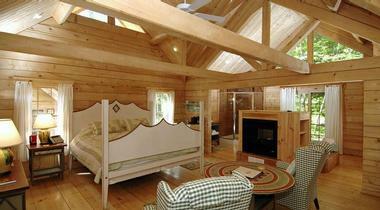 As you would expect, the rooms are beautifully appointed and have everything you need for a comfortable stay. The hotel is perfectly located just minutes away from downtown Orlando and also features a heated outdoor pool and communal Jacuzzi.